Otago/Southland | Triumph Owners Motor Cycle Club NZ Inc.
All TOMCC NZ members are invited to ride it all or part of it. 5th to 20th Feb 2018. As with our previous Twisted Thislte Tours it takes in the ride to and following on from our TOMCC NZ National Rally and its about riding some of New Zealands best riding roads. All weather tour & accommodation is as we go. TOMCC NZ Otago Southland Chapter. Moose Safari 2017. Riding into Milford Sound and return trip down to Gunns Camp, Hollyford Road. The Southern Moose Safari is on again …. as we did in 2011,2013 & 2015. 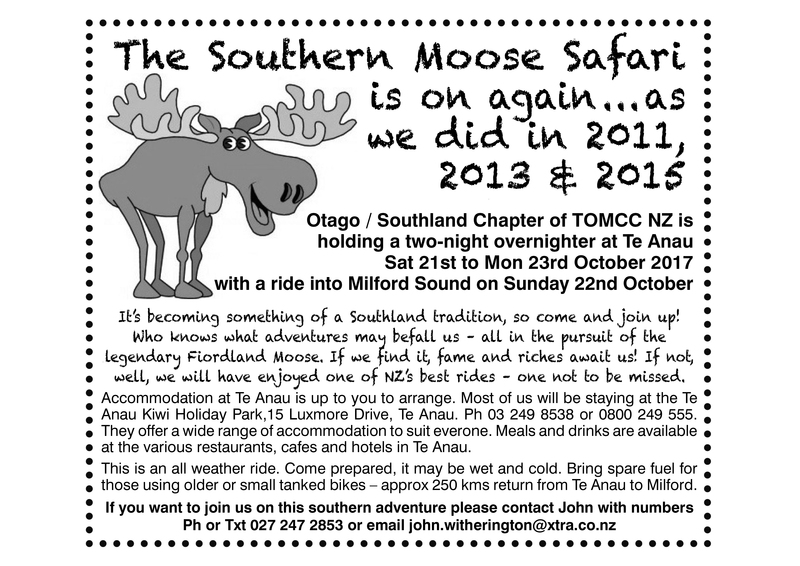 Otago / Southland Chapter of TOMCC NZ are holding a two-night overnighter at Te Anau. Sat 21st to Mon 23rd October 2017 with a ride into Milford Sound on the Sunday 22nd October. Its becoming something of a Southland tradition, so come and join up ! One of New Zealands best roads to ride – one not to be missed. Bring spare fuel for those using older or small tanked bikes – approx 250 kms return from Te Anau to Milford. As with all our Otago – Southland events this is an all weather ride. Come prepared. If you want to join us on this Southern adventure please contact John with numbers. 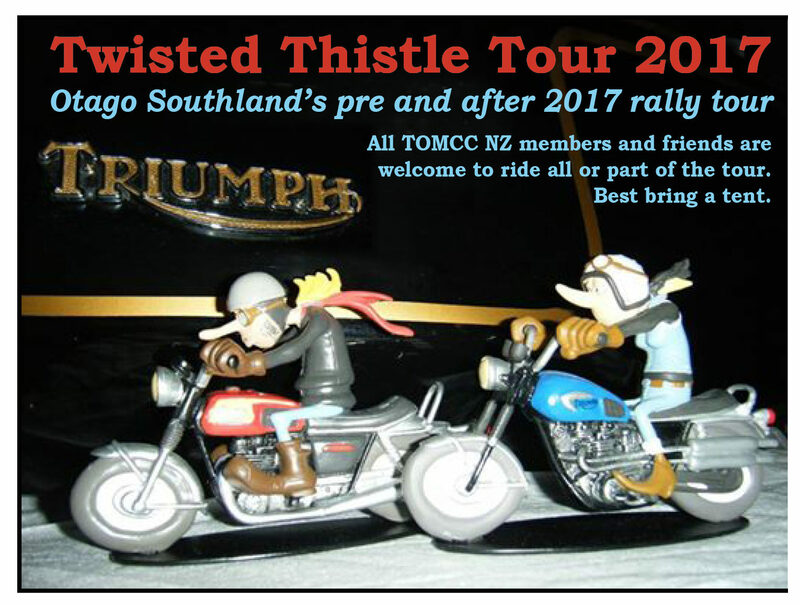 As with our Twisted Thistle Tours, this tour, from 8th to 20th February 2017 takes in the ride to, and following on, from our National Rally and is all about riding on some of New Zealand’s best riding roads. As usual it is an all weather tour, and accommodation is ” as we go ” – so best bring a tent. More details to come via our next newsletter, website and social media sites.